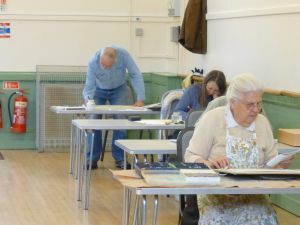 We occassionally run turored one day workshops at Warsash Victory Hall, such as the watercolour painting with Joe Dowden in June 2018. Dates of future workshops will be announced to Warsash Art Group members by at our Thursday evening meetings, by email and, if possible, in newsletters. They usually fill up fast, so be sure to book your place early with the Classes and Workshops Organiser. At St Mary’s Church Hall, Church Road, Warsash. Tutored Kay LePoidevin , a mixture of painting media. 2019 classes begin in mid-January and run for ten week terms. The summer term begins in April and the autumn term in September. Booking forms are mailed with newsletters and are available via our Workshop Organiser. These classes are always very popular with our members and fill up quickly, especially the morning class. Applications will be taken on a strictly first come first served basis and the numbers in each class are capped at 18. 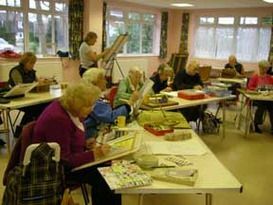 To come to our classes, you need to be a paid-up member of Warsash Art Group. There is a small charge for the term to cover the cost of hiring the hall. This is payable at the first meeting. Copyright © 2013 Warsash Art Group. All Rights Reserved.